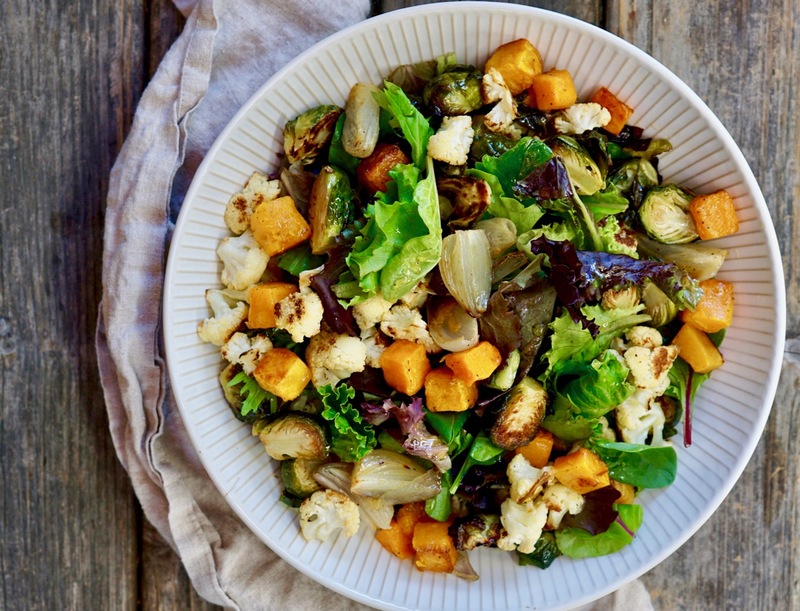 For the Vegetables: Place the butternut squash and Brussels sprouts on one sheet pan, place the cauliflower, shallots and garlic on another. Drizzle 2 tablespoons of olive oil on each sheet pan. Season each with 1/2 teaspoon salt and some black pepper to taste. Using your hands, gently toss the vegetables to coat evenly with oil. Place in the oven and roast, till tender, rotating the sheet pans once, for about 20-25 minutes. Allow the vegetables to cool slightly. For the Vinaigrette: While the vegetables are roasting, prepare the vinaigrette. In a small bowl, add the apple cider vinegar, honey and salt. Mix well. Slowly whisk in the olive oil. Adjust the seasoning as needed. To serve, Place the mixed baby greens in a large serving bowl. Add the cooled roasted vegetables. Drizzle with the apple cider vinaigrette and gently toss. Serve immediately. The perfect salad for the holidays. Go healthy and hearty with this roasted winter vegetable salad with a lovely apple cider-honey vinaigrette.